If U.S. Representative Jim Moran had had his way, the days of traveling circuses would have already come to an end. That's right . . . “lions and tigers and bears . . . oh no!” In 2014, he took an historic stand for animals by reintroducing the Traveling Exotic Animal Protection Act (H.R. 4525), which would end the use of wild and exotic animals in traveling circuses, over concerns about their welfare and safety risks they pose to us. The Bill Died in Congress . . . Greatest Show on Earth weighs in . . . Interesting to note however, in my previous post, “When The Elephant In The Room Is No Longer In The Circus,” RBBB did give in to public protests regarding their treatment of elephants. “There's been somewhat of a mood shift among our consumers," said Alana Feld, the company's executive vice president. "A lot of people aren't comfortable with us touring with our elephants." The Feld organization now owns 43 elephants, and 29 of the giant animals live at the company's 200-acre Center for Elephant Conservation in central Florida. Thirteen animals will continue to tour with the circus before retiring to the center by 2018. A City Takes the Lead . . . The ban affects just about any animal but domestic cats, dogs and horses and livestock like cattle, sheep, pigs and goats. Not only would lions and tigers and bears be barred from local performances, but so would elephants, sea lions, ferrets, dolphins and even ostriches and emus. As other cities and states follow suit with similar legislation, supporters of these bans continue to argue the issue needs to be addressed on a federal level in the U.S., not only because it just needs to end, but because the mobile nature of circuses makes it difficult for law enforcement and inspectors to follow up on incidents and violations of the Animal Welfare Act, of which there are many. 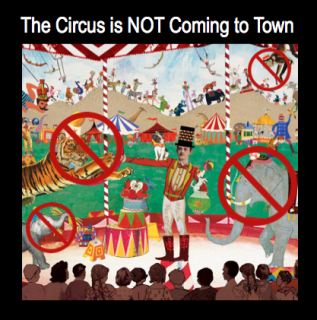 U.S. citizens can help by signing and sharing a petition urging Congress to make the U.S. one of the next nations to pass laws that would ban their use in circuses. To date, almost 30 countries have already passed legislation as of this posting, and there there are over 61,000+ signatures on a U.S. petition. Won’t you add your name and help circulate this petition to others?